Meatless Monday with a middle eastern flair! In small pot, heat oil over medium heat. Add onions and sauté for 5 minutes. Add garlic, rice, cinnamon, ginger, cumin, crushed red pepper and lime zest. Toast rice and spices for 5 minutes. Add 1 cup water, continue cooking according to packaging instructions. Remove from heat and stir in raisins and almonds, sprinkle with ¼ cup chopped cilantro. Reserve in serving bowl. Meanwhile, in a nonstick sauté pan over medium heat, add garbanzo beans. Cook for 5 minutes. In a small bowl, whisk together korma and remaining 1/4 cup water. Pour sauce over garbanzo beans and cook for 10 minutes or until sauce is thickened, stirring frequently. 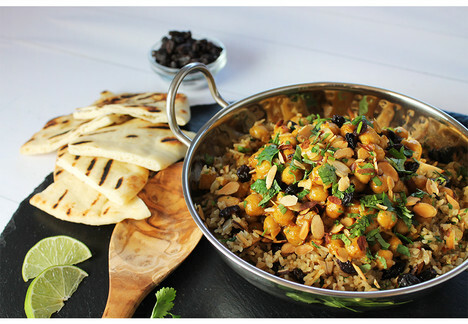 Pour garbanzo beans over rice and garnish with remaining cilantro, raisins, almonds and desired amount of lime juice. Season to taste with salt.